If people would just stop buying GMO tainted crops as well as the farmers buying the seeds, would put Monsatan out of business! But I don’t see that happening sadly. You can fool some of the people, some of the time……..
Just have to follow Register of Owners to realise who controls Monsanto and what it means to the share prices. With Bill Gates being a notifiable owner, need to view up & beyond. The facts don’t support you. 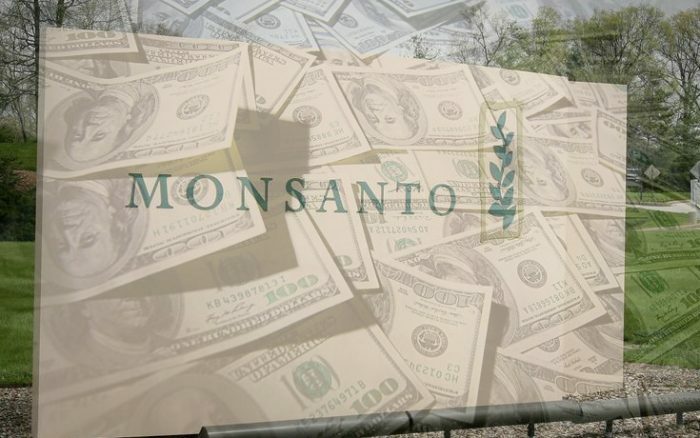 Gates has a very tiny fraction of Monsanto, less than 0.1%. The largest owner of Monsanto stock has less than 6%, and is also the second largest owner of Whole Foods Market. You do realize all that soy replacing the GM corn is also GM, right? Yes we do. Support Maui’s proposed Moratorium on the planting of new GM crops. This is huge and on the Nov 4 ballot. Eighty percent (80%) of GM corn seed planted around the globe is produced on Maui! They are attempting to crush our voices with money and lies blanketing the island in deceptive ads on the internet, radio, TV and flyers, just like they do in California, Washington and now Vermont. http://shakamovement.org/ This one must be won. They lose money every 4th quarter. It’s a non-sales quarter so all they have are expenses. This year they lost LESS money in the 4th quarter than the year before and you think you’re doing something RIGHT??? That Monsanto will lose capital and go bankrupt is the greatest LOL in History. It has changed America sorry North American Union into the Land that controls Genetically Modern that poisons everyone except those from AICAP. You need a better economist. This up and down has happened repeatedly for them over the fast five years, but that doesn’t change the steady increase. Look at the S&P 500 5 year scale. Where can I buy non-GMO corn that I can afford? Just off the top: Drive out to the country and ask around if there’s no local farmer’s market. If you find some advertised as non-GMO, ask for a guarantee (call it an assurance). Buy a bunch and have an ear tested before you consume any. Buy blue corn it is not Gmo at this time. That’s the only corn I use. You can even buy the blue corn ships at multiple stores including Sprouts, Mother’s, Fresh and Easy etc. The blue corn is delicious as well. Knowledge and Truth are Power. Lies will lose in the end, every time. It’s just a matter of When.